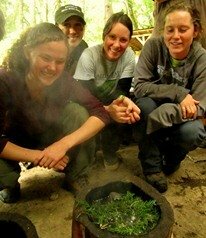 Understanding how to build a fire pit with safety and utility in mind is an important wilderness skill. From keeping warm in cold weather to cooking food and providing light, proper fire pit construction is important to make the most of your outdoor experiences. Three important concepts are outlined below: safety considerations, fundamentals of construction, and useful accessories/tips. 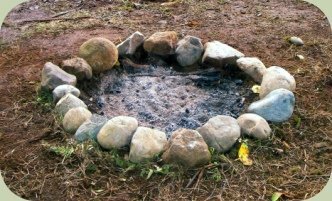 Use stones to make a fire ring (this also helps protect and concentrate your fire) Caution: do not use rocks that have been submerged in water, as they can explode when heated. A stone fire pit also retains and radiates heat. Incorporate a Heat Reflector: You can utilize a natural feature such as a large rock or embankment as a "heat reflector" to keep heat from escaping your fire pit area and further protect the fire from wind. Heat reflectors can also be created by building a small wall out of stones or logs. Designate a cooking area within your fire pit: You can shape your fire ring to have a small bump out for cooking food. Coals can be pulled into this spot to cook over, while your main fire can continue to burn providing light and warmth. Coals cook food far more effectively than flame. Drying Wood: Wet wood can be stacked around your fire pit in an "eagle nest" shape. Be sure to monitor wood being dried in this manner so that they do not catch on fire. Wood Selection: Small branches from softwoods provide the best kindling for starting a fire, though once your fire is established, seasoned hardwoods will burn hotter and brighter with less smoke. Examples of hardwoods include oaks, maples, and cherries. Also, be sure your wood is dead and dry. Wet or green (live) wood either burns very smoky or often does not burn at all. Building a fire pit in the wilderness is often a rewarding experience. Now you're ready to enjoy a great night around the campfire!